In the Capital City of Azerbaijan, Baku, the Indian Grandmaster and reigning World Chess Champion Viswanathan Anand was honoured for the Fifth Time with the prestigious Chess Oscar. Doordarshan TV will broadcast a special edition of the ceremony, Produced and Directed by Vijay Kumar. 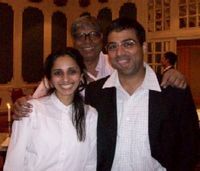 The documentary contains exclusive Interviews with Vishy Anand , a short history of his important wins at various world events , his First World Title at Tehran, followed by his 2nd World Title at Mexico city and than at Bonn where he defeated the Classical World Champion Vladimir Kramnik to become the undisputed World Champion. The telecast can be viewed on all DD Sports Channels (accessible to over 200 000 million people in the world) 5th October 2009 at 10.30 p.m to 11 p.m local time. To view the event by satellite, check out the details here.